Price from: $1224 - Book now! Welcome to Phnom Penh, Cambodia’s vibrant and bustling capital city. Despite its recent turbulent history, Phnom Penh’s wide tree-lined boulevards and faded colonial mansions hold an undeniable charm. Upon arrival, our tour guide and driver will meet you at the airport and take you to your hotel. You can enjoy some free time to rest and refresh before taking a drive to the dock to catch an evening boat cruise along the Mekong River. If the weather permits, you will see the beautiful sunset over the shimmering city. Today we leave the bustle of the big city on a drive through Cambodia’s beautiful countryside and largest rubber producing region on our way to Kampong Cham. Let’s explore this quaint colonial town and see the Wat Nokor Pagoda—an 11th century Mahayana Buddhist shrine and home to a large reclining Buddha as well as many carved Buddha’s images. Continuing on our afternoon journey to Kampong Thom, we will stop along the way at Phnom Pros and Phnom Srei. Arrive in Kampong Thom and check in at the hotel around lunchtime. Spend the late afternoon on a pleasant walking tour through some nearby villages, and climbing the 980 steps to the top of Phnom Santuk for a superb sunset view. Spend the morning exploring the ancient temples around Kampong Thom, before continuing on our way to Siem Reap. Kampong Thom is home to Cambodia’s most impressive group of pre-Angkorian monuments. Here we will visit the ancient temple complex Sambor Prei Kuk, situated just north of the town. The main temples are divided into three complexes, all dedicated to Shiva. Enjoy the serene atmosphere as you wander through these 7th century brick monuments, artfully scattered around the jungle. In the afternoon we continue on our journey to Siem Reap (147km, 3hrs drive), the gateway into the legendary Angkor temples. Arrive in Siem Reap in the late afternoon. For the early birds and photographers, we offer morning tours by tuk tuk for those who want to see the sunrise upon the Angkor Temples. This takes place from 4.30 AM till 6AM and after sunrise we’ll return to town for breakfast. After breakfast at the hotel your day starts with visiting South Gate of Angkor Thom, with its majestic doors, monumental temple of Bayon facing the tropical forest and Baphuon and Phimeanakas Mountains. Later, visit the Elephant Terrace, Terrace of the Leper King and Takeo "Jewel of Crystal", which is dedicated to the Hindu God Shiva and was erected at the end of the 10th century. You won’t miss Ta Prohm Temple, which is a wonderful combination of human genius and natural beauty with its giant trees that have grown there for centuries. In the afternoon, visit Angkor Wat, the UNESCO World Heritage Site, which was constructed by Suryavarman II who reined Cambodia from 1113 to 1152 and built the five towers in the 12th century and dedicated them to the Hindu God Vishnu. The plan of the pyramidal conception of the temple combined with spaces, alleys and ditches is an ancient masterpiece of architectural design and construction. Start the day touring more of the stunning temples in the Angkor Archeological Park before driving to Cambodia’s largest natural water reservoir, Tonle Sap Lake. After breakfast at the hotel, travel by car to Banteay Srei, home to Angkor’s finest stone carvings, followed by Preah Khan (Sacred Sword): one of Angkor’s largest temples, constructed in the 12th century by Jayavarman VII. In the afternoon, we head out of town and embark on a short cruise along Tonle Sap Lake to visit the local floating villages following the drive to the Angkor Archeological Park in the evening to watch the sunset from the foot of Phnom Krohm Mountain. This morning, we travel to Koh Ker. Here we will discover the old abandoned temples in the forests of northern Cambodia. Also known as Chok Gargyar, this region once served as the capital of Jayavarman IV until his son and successor, Harshavarman I, moved the capital back to Angkor. There are more than 30 major structures and archaeologists believe there may have been as many as 100 minor sacred buildings in the region. In the afternoon, drive back to Siem Reap, stopping en route to visit the remote and jungle-covered Beng Mealea temple. Today we travel by car to Battambang, Cambodia’s second largest city. Enjoy breakfast at the hotel then drive to Battambang arriving in the afternoon. Check in to your hotel then enjoy a walking tour through the city’s bustling boulevards lined with quaint French colonial buildings. Next we will visit some of Battambang’s signature hilltop temples as well as the infamous cave, Phnom Sampov, used as an execution field under the Khmer Rouge. 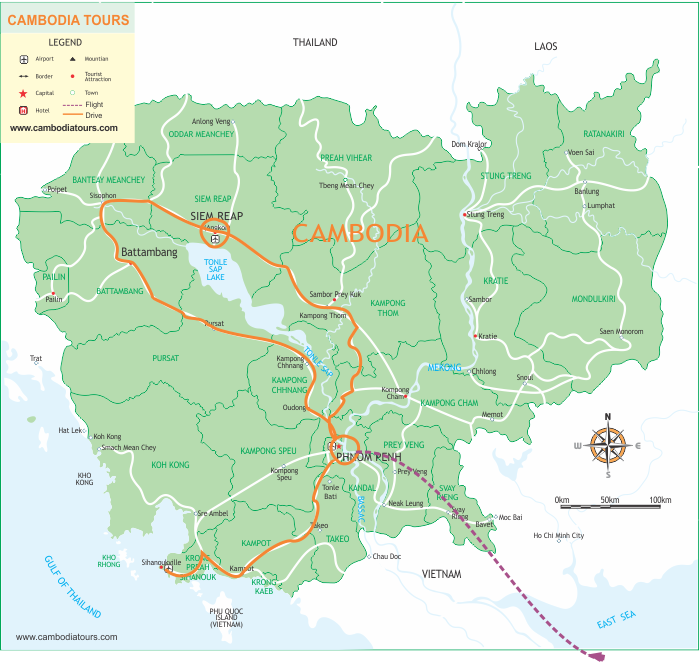 Today we drive from Battambang to Cambodia’s capital city, Phnom Penh. Get a taste for Cambodia’s rural life and stop en route at Kompong Chnang to visit the floating village in Kompong Luong. Arrive in Phnom Penh in the afternoon and check in to your hotel. Enjoy some free time to relax then try out your best bargaining skills on a walk through the city’s expansive “Russian Market,” where you can find anything from motorcycle parts to valuable gems. Leaving Phnom Penh, we drive to the seaside resort, Kep-sur-Mer, a favorite getaway of the French in the early 1900s. Have breakfast at the hotel then begin our journey southwards, making our first stop at Phnom Chisor Temple and dating back to the 11th century. Climb the 500-step path to the top of the hill to enjoy the panoramic views of the surrounding countryside. Continue on to the quiet town of Takeo before taking a short cruise to Angkor Borei, located just a few kilometers from the Vietnamese border. Here we visit a small museum displaying several reproductions of sculptures from the nearby ruins and a selection of artifacts dating as far back to the 4th century. After visiting the museum, we embark on our boat for a trip to visit the pre-Angkorian temple, Phnom Da, and a nearby temple Asram Maharosei. We arrive in Kep in the evening and check in at the hotel. Enjoy breakfast at the hotel then board a local boat for a 30 minute sail to Rabbit Island. Spend the afternoon bathing in the warm waters and snorkeling around the surrounding rocks hiding many colorful fish. Return to Kep in the late afternoon and spend the rest of the day at your leisure. After breakfast at the hotel, head to Sihanouk Ville, home to some of Southeast Asia most pristine white-sand beaches. With a 10km stretch of beaches and a smattering of costal islands, Sihanouk Ville is the perfect tropical, beach getaway. En route visit Kampot’s highlights: the cave of Phnom Chhnork. Inside the cave you will discover the remains of a 7th century brick temple. After this you will visit the caves of Phnom Sla’an, if you are feeling adventurous you can scramble through this cave until you magically appear into the sunlight on the top of the hill, being rewarded with perhaps some of the most beautiful views in Cambodia, with the traditional countryside stretching off into the Gulf of Thailand and its many islands. During the 1960’s Kampot was world famous for its aromatic pepper. A visit at pepper plantation will help you understand why, and you can observe the work of local community living there. Arrive Sihanouk Ville in the later afternoon and stay at your leisure. Enjoy an entire day free for basking in the sun or bathing in the warm coastal waters. This is the time when the dream of spending holidays in an exotic country becomes a reality. You are free at your leisure. Enjoy breakfast at the hotel before driving to Phnom Penh’s airport to catch your flight home. Note: Please be aware that flight times, hotels and all other logistics, services and days of travel are subject to availability.